What a difference a decade and a different political party make. In November 2005, Ohio GOP Congresswoman Jean Schmidt used the same "I'm just quoting someone else" technique to criticize a fellow Member which Massachusetts Democratic Senator Elizabeth Warren employed earlier this week to criticize since-confirmed Donald Trump Attorney General nominee Jeff Sessions. Schmidt was vilified to the point where she became the subject of ridicule on Saturday Night Live, while the intemperate Warren has become such an instant heroine on the left that she seems a likely favorably-portrayed subject of a skit this coming weekend, and a future candidate to host the show. 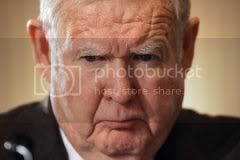 Bloomberg News managed to pen a full obituary of the late Congressman Jack Murtha today, calling him a "Supporter of Troops" in the headline, without once mentioning his incendiary--and unfounded--claims that a group of Marines had murdered 24 Iraqis in cold blood (h/t Washington Examiner's Mark Hemingway). Murtha, himself a former Marine, said in 2005 after two dozen Iraqis were killed in the city of Haditha, "there was no firefight, there was no IED that killed these innocent people. Our troops overreacted because of the pressure on them, and they killed innocent civilians in cold blood." Eight Marines were charged in the killings. Charges against six of them have been dropped, one has been found not-guilty, and the case against the remaining Marine is pending. Murtha was unrepentant about the slanderous accusations he leveled against these Marines. He even compared the Haditha incident to the My Lai massacre during the Vietnam War (see video below the fold). Rather than lie low, Murtha further made himself a target with public comments in the spring of 2006 pressuring the Marine command to investigate allegations of civilian casualties at Haditha, Iraq. This infuriated many Marines, and critics argued that the congressman had become more partisan himself out of loyalty to Pelosi. But Murtha went beyond pressing for a formal military investigation, which is a legitimate call any congressman could and should make after an incident like Haditha. The former Marine practically declared the Marines at Haditha guilty by saying they have killed "in cold blood." Updated: Washington Post adds mention about Murtha's Haditha comments, thanks me for me pointing out omission (see bottom of post). Rep. Jack Murtha (D-Pa.) passed away earlier today, and the Washington Post has already published a 26-paragraph obituary. 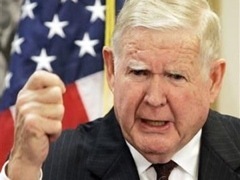 Post staffers Martin Weil and Carol Leonnig don't gloss over some of Murtha's political controversies, such as his penchant as a pork barrel appropriator and his role in the Abscam scandal. Yet oddly enough, Murtha's most profoundly jarring political scandal -- his insulting and untrue smear of U.S. Marines at Haditha as cold-blooded killers -- went unmentioned. Hot on the heels of Congressman Jack Murtha charging the voters of western Pennsyvania as being racists who will probably hurt Barack Obama in that state comes the breaking news this evening that Murtha has cancelled a scheduled debate set for tonight with his election opponent. Pretty big news but guess what? Your humble correspondent is currently unable to find this stunning information in any mainstream news outlet. Another day and another Marine acquitted of charges from the so-called "Haditha massacre" that left-leaning journalists (doing the bidding of Democrat Jack Murtha) insisted actually happened. A military jury has acquitted 1st Lt. Andrew Grayson of all charges that he helped cover up the killing of 24 Iraqis in Haditha following the IED ambush of a Marine patrol. Can you imagine any major television news network doing a report on a Republican Congressman's history of exorbitant earmarks without mentioning his Party affiliation? The words "Republican," "GOP," "right-wing," or "conservative" would likely appear in almost every sentence, correct? "What do you think of Rush Limbaugh's comment the other day that somebody was a phony soldier because they opposed the war? He also said they were a phony Republican, by the way, because he said Republicans couldn't possibly, a Republican couldn't possibly be against the war? What do you make of that?" Rep. Jack Murtha: "I don't watch Rush Limbaugh." Matthews: "Ha! You don't have to watch him, you gotta hear about him. I don't either, I hear about him." 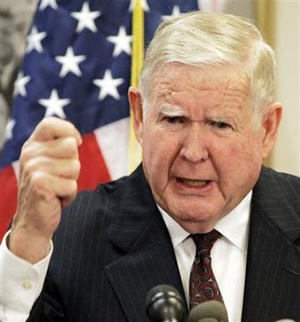 On November 17, 2005, Rep. Jack Murtha (D-Pa.), who had previously supported the Iraq war, announced his call for the withdrawal of U.S. troops. The story led all three broadcast network evening news reports. A mirror-image shift of position was reported today: a previously anti-war Dem has announced, after a visit to Iraq, that he now opposes withdrawal at this time. Will the MSM give anything like equal time to the story? We're on the ground now. We have a responsibility to the Iraqi people and a strategic interest in making this work. I think we're making real progress. I think the consequences of pulling back precipitously would be potentially catastrophic for the Iraqi people themselves, to whom we have a tremendous responsibility … and in the long run chaotic for the region as a whole and for our own security.